The Rags to Riches Story of Albert the Foster Adopted Beagle! It is with great sadness and a very heavy heart that I write this. On Friday, November 20 in the wee hours of the night, my beloved boy Albert passed away peacefully after fighting off a major post-operative infection. Albert had major surgery on Friday, November 6th to remove a blockage. The little guy had decided to eat a throw rug the week before. We think that he had a sore tummy (he'd been eating grass) and because he couldn't get outside for grass overnight, he ripped apart the carpet to get something into his stomach. I thought he had thrown it all up, but as the week progressed he started to slow down. A trip to the emergency clinic suggested he likely needed surgery. I took him to my amazing vet, Dr. Hannah at St. Clair Veterinary. She did a barium xray and called me to say he needed immediate surgery. She estimated it would take just over an hour. After 4 hours of surgery, 3 vets working on him, and 7 major incisions in his intestines, Albert's stomach was clear, but he had a long road to recovery ahead of him. Initially Albert's recovery went well...but he quickly started to decline early this week. His belly slowly got more swollen, he wasn't able to walk very well. I took him to the vet immediately. Dr. Hannah confirmed that he had peritonitis - an infection in his stomach cavity. She kept him comfortable on fluids and morphine, but his white blood cell count just kept climbing. His little body just wasn't able to fight it. I will miss Albert more than you can imagine. That little beagle that could had a profound impact on my life, and I find it hard to believe that he was only with me for 2 years. The pain of the loss is profound, but I take great comfort in knowing that Arthur, Stella and I gave him the best 2 years of life. Rest in peace little man...when you feel up to it, go for a stroll and try to find my dad...he could use a good little hound dog and he'll take good care of you. IMG_2716, originally uploaded by estrojennie. here they are crashed on the couch. in this kind of heat they'd much rather hang out here in the air conditioned living room than outside in the smoldering hot backyard!! this afternoon I went out into the backyard, and there was Albert sunning himself. on top of the hot tub (the lid was on!). how cute is our rescue beagle!?!?! IMG_2648, originally uploaded by estrojennie. This is Stella getting out of the water on our canoe trip. That's our friends son Tavish...he got so excited whenever a dog went into the water. IMG_2602, originally uploaded by estrojennie. Albert went on his very first canoe trip last weekend!! we were a bit nervous, as we had no idea how he would react to water, the canoe, wearing a lifejacket, sleeping in a tent, and hanging out around a camp fire surrounded by a million good smells. Arthur and Stella are great camping dogs, but Albert blew us away! He stayed on leash the entire weekend and didn't make a peep, he loved sleeping in the tent, and as it turns out...he isn't afraid of water and actually did a little swimming when Adam put him in. Have I mentioned lately how awesome Albert is??? isn't she the sweetest thing you've ever seen? this little beauty is our newest rescue beagle!! i fell in love with her the second i saw this picture...but then i heard about her emergency dental surgery and loved her even more. this little lady had...are you ready...THIRTY FIVE teeth removed. she has 5 left. but now she's pain and infection free...and hey, she'll get to scarf down Merrick's amazing wet doggie food for the rest of her days! i never get sick of helping rescue beagles...ever. and i never get tired of the stories we hear from foster parents who experience exactly what my family did when we fostered Albert. it's always amazing for me to hear the same things again and again "she/he is like a new dog", "they are the best pet we've ever had", "we can't believe how much she/he has changed". if you've never thought about fostering, you should! it's a really amazing experience. this is arthur at the park on saturday. he was really hot. 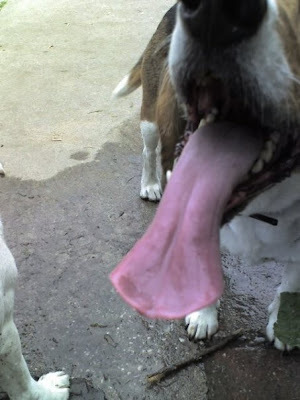 check out that tongue! also wanted to mention that i have added google ads to my blog. 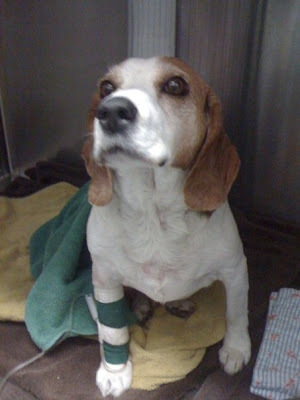 if you click on the ads all ad revenues will be donated to Big on Beagles!!! Albert is a beagle that was rescued from a shelter by Big on Beagles (B.O.B) - an assistance agency for beagles experiencing troubled times. We initially were Albert's foster family...but this little beagle had far too much charm for his own good. Over the weeks and months that he was in our care, he transformed himself from a terrified dog into a grade A lap hound. We love him dearly and have since adopted him. My name is Jenn, and I'm the loving mother of 3 beagles - Arthur (6 years old) and Stella (7 years old) and of course, Albert! Albert came to us as a foster dog through the Big on Beagles foster program. We fell in love with him about 2.6 seconds after he entered our lives, so...we adopted him!